Granted, I’ll admit that’s a lot of responsibility to put on a fun event like a country music concert, however, as you may already know, ‘this isn’t your typical country music review site‘. It’s taken me three days since attending Tim McGraw’s concert to decide upon the hidden gift in that incredibly fun night! Oh yes, if you get a chance to see the master live, be sure to take it, you won’t be disappointed! Thanks To the Efforts of My Friends, We Had Floor Tickets! You guessed it: Floor tickets mean standing, standing means jumping, jumping turns into dancing …. make that five hours in total of standing and dancing! The entire event was my own much needed reminder of what it’s like to completely unwind and have a full-on blast! Most of us know what it means to be ‘out-of-balance’ in our lives: Too much of any one thing or habit is never a good thing. If you’re swinging that pendulum in one direction, I’m sure you know the area of your life you’re over doing. Mine, as you probably figured out is to remember that life doesn’t always have to involve working. And by working I’m including tasks and responsibilities that don’t hand out a pay cheque for doing them! The Secret of the Middle Way is Chapter 18 of the New York Times Best Seller ‘The Untethered Soul ‘ by Michael A. Singer. One of the best books I’ve read, ‘The Untethered Soul‘ serves as a foundation for those ready for true transformation. You’ll find yourself in every chapter. In chapter 18, Singer explains exactly how we waste tremendous life energy living at the extremes. What is The Middle Way? 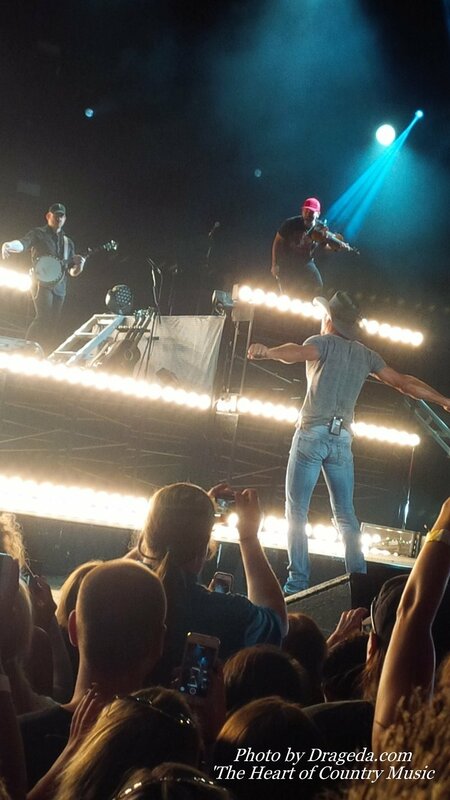 Tim McGraw’s Shotgun Rider Concert showed me just how out of balance my life really is. Until that moment, I had truly forgotten what it meant to have unbridled fun. Apparently, I lost ‘my way’. Thank you to my friend Joyce and her son Scott and her daughter Jade and Jade’s boyfriend Zach for helping me find my middle, my ‘Way’. Their kindness secured floor tickets and also managed to get us seated on stage! The results were not only fun, but also enabled me to capture the close-up photos featured below. His tour currently runs until October 2015. To secure tickets, you can visit Timmcgraw.com where you’ll find tour dates and their respective cities. Fans can follow Tim McGraw on Facebook & Twitter. Tim McGraw has been working for years with Operation HomeFront and Chase Bank to provide Mortgage free homes for Veterans. In fact on his 36 City 2015 ShotGun Rider Tour he has and will continue to give away a home to a Veteran after each show date. Tim McGraw is quoted on his official website as saying “These families made an incredible mark on me, and I’m more grateful than I’ve ever been for the sacrifices they make every day to serve our country”. You can read more about this worthy and generous cause here.